JOHN CAMMISH was born on May 23rd, 1823. Whilst pursuing his occupation as a fisherman, a deep sense of conviction of sin overtook him out on the great deep, and, like many another, after a severe inward struggle, even there on the billows he found peace with God through Christ Jesus. Under Rev. Jas. 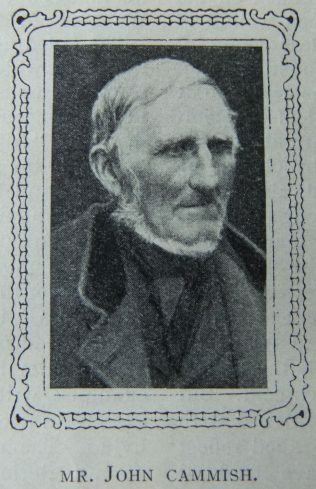 Dawson, then senior minister of the Scarboro’ Circuit—which at that time included Filey— within two years he was promoted to the position of assistant Class Leader, and upon the death of George Jenkinson in April, 1876, Bro. Cammish entered into full charge of the class, and has remained a leader ever since. He has been a preacher on the Circuit plan for no less than half a century his name first appearing contemporaneously with that of the revered and sainted Jenkinson Haxby, and being placed there by Rev. J.T. Shepherd as superintendent minister. The two old men have often recalled how when striplings they went to preach at the Scarboro’ Camp Meeting, and had the honour of seeing no less a personage than John Flesher in the congregation. Of tall fine physique, still erect at eighty-seven, and without stick of staff, our friend is a prominent and picturesque figure as, clad in fisher costume he is seen on Filey sea-front. He is remarkably fresh and hale scarcely knowing what it is to be ill. His face and forehead are of striking intelligence. He is a constant reader of the London Daily News, and watches with keen interest the political situation. Considering his calling he has been a hard student, the Bible being his chief text book, and his prayers and sermons are rich in Scriptural quotations. His memory is still good, and he can freely converse on the various subjects under his observation. John was baptised on 19 August 1823 at Filey, Yorkshire. His parents were William, a fisherman, and Mary. John married Elizabeth Jenkinson (abt 1829-1887) in the summer of 1849 at Filey, Yorkshire. Census returns identify ten children. John died in late 1918 at Filey, Yorkshire.